Spring Library Workshops: This spring, we will hold workshops covering topics in library research. Workshops are held on Tuesdays and Thursdays, noon-1pm in the computer lab. Within a competitive academic job market, it is important to begin engaging with scholarly discourse even as a graduate student. This workshop will discuss how you can get started with that, and what publishing and presentation venues make the most sense for new scholars. This workshop is open to current doctoral students. This workshop will cover the nuts and bolts of submitting your finished dissertation manuscript to ProQuest, and what to consider as you start to turn your dissertation into a book. This workshop is open to current doctoral students. Dr. Donald Guthrie will talk about his new book, The Politics of Ministry: Navigating Power Dynamics and Negotiating Interests. Join us for a screening of the documentary Deej. Ruth Stieff will lead a Q&A after the movie about the unique challenges students with autism face as they enter higher education. 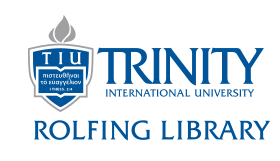 Open to any in the TIU community. On the first and third Tuesday of every month at 10:30 AM, a fun story time will be offered for kids. A parent or guardian must be present.